To whom the thought of Christmas brings no cheer. SeaGen, the tidal power generator operating in Strangford Lough (UK), is generating enough electricity for 1,000 homes. A second such plant, seven times more powerful than SeaGen, is planned for the waters off Anglesey. However, these projects are insignificant compared to the 260 MW. tidal plant off the coast of South Korea and the two additional plants, totalling 460 MW. planned elsewhere on the coast of Korea. Peter Fraenkel of Marine Current Turbines, the builders of SeaGen, believes that tidal streams could contribute up to 12% of UK electricity needs provided there is a significant increase in government subsidies. The Scottish government already provides 50% more in subsidies for the development of tidal energy. The world’s first full-scale floating wind turbine, off the Norwegian coast, sits on a weighted buoy extending 100 m. below the surface. Three anchor points prevent the turbine from floating away as well as linking the structure to undersea cables. Floating turbines benefit from higher wind speeds far out at sea and would bring offshore wind power to coastal areas, such as in Japan and the USA, which lack shallow water sites. Statoil-Hydro has invested £42.8 million in developing and building the pilot project. Opponents of wind power say that the wind is so unreliable as to be useless as a source of energy. Therefore gas-fired power stations are needed to generate spare electricity in case the wind suddenly drops. Any reduction in CO2 emissions is negligible, they say, and the cost of installing turbines is huge. However, new evidence from Electrica de Espana, where 14% of electricity is generated from wind, shows that none of this is true. 1. Good grid management can integrate large amounts of wind energy provided that pumped storage and hydraulic power is available for storage and international connections enable easy export and import. 2. CO2 emissions during the night of 8/9 November, when strong winds were providing 53% of Spain’s electricity needs, were 145 g. per kWh – about a quarter of typical UK emissions from electricity generation. 3. The Spanish system pays wind park owners 75-90 euros per MW hour, which is considerably less than the UK pays to wind farm operators. 4) Providing incentives for building a huge number of extra wind turbines. A month ago the world’s largest hydro-electric wave energy generator was opened at the Marine Energy Centre in Orkney. The Oyster energy generator produces power by pumping high pressure water to its on-shore hydro-electric turbine. The power will be fed into the national grid to power homes in Orkney and around Scotland. Opening the plant, Scotland’s First Minister said: “Scotland’s renewables capacity is estimated at around 60 gigawatts. Our waters hold around 10% of Europe’s wave power potential and 25% of its tidal power potential.” He confirmed R & D funding of nearly £1 million for Oyster 2 which could be installed within two years. “Eating the Planet”, a new report from FoE and Compassion in World Farming, suggests that we can still eat meat while feeding the world, by using planet-friendly and humane farming methods. Production of meat and dairy products already generates more climate-changing emissions than all the world’s transport. The researchers find that eating meat three times a week can allow forests to remain untouched, animals to be farmed in free-range conditions and greener farming to be used. FoE comments: “It’s amazing news that we can feed a rapidly expanding population without trashing the planet – and still eat meat several times a week.” Amazing, indeed. But will any change to farming-friendly methods outpace the rapid growth in meat-eaters throughout the world? William Davies, a former director of the Grassland Research Station, warned in 1952 that land maintained under a monoculture of cereals often ended up in poor shape, with the risk of erosion when land was cropped with cereals for too long. “If the world is to feed itself better – and at the same time increase its population – it must farm its soils better than it has ever done in the past. It has become apparent that the grass crop plays a more fundamental role than any other.” But within ten years, government subsidies for cereal growing, particularly under the CAP, persuaded farmers to invest in the necessary machinery and chemicals. Subsidies still drive this wasteful system. Even the new support for biofuels is in reality a grain subsidy in disguise. Perhaps just as concerning, as Christians, is the WAY they teach us to want new things - through lust, greed, coveteousness and ambition..... Not very Christian motivations. How will farmers cope with the inevitable rise in fossil fuel prices in addition to the inevitable impacts of climate change? Graham Harvey in “The Carbon Fields” points out that farmers around the world are ploughing up grasslands and sowing new high-yielding annual crops. In doing so, they are making the world dangerously dependent on oil in the form of pesticides and chemical fertilisers. They are also reducing soil fertility, so threatening the food supply of future generations and exacerbating climate change by releasing greenhouse gases into the atmosphere. Instead of helping to stabilise the world’s climate, modern high-yield agriculture is making things worse. I was buying some books on Amazon the other day when I came across a title by John Elkington called 'The power of unreasonable people: how social entrepreneurs create markets that change the world". The review of this book quotes George Bernard Shaw - "The reasonable man adapts himself to the world; the unreasonable one persists in trying to adapt the world to himself. Therefore, all progress depends on the unreasonable man". I found this quote quite interesting from several angles. From an environmental point of view, it could be argued that reasonable people are good. After all, it is our insistence on changing the world to suit us which has led to the ecological crisis we are now facing. Just think of how the first settlers in Australia wanted it to be England so much that they introduced rabbits and foxes just to make themselves feel at home. On the other hand, a reasonable person would say that we should now fit into the world and its systems as they currently stand. It is reasonable to use the system for your own ends, but not to try and change the system for the benefit of future generations. It is not reasonable for you to deny yourself now because your children's children might need the resource you are using. It is not reasonable to give up your life in a fight for a justice that might never come. So, if we are going to save the environment, we probably need unreasonable people. To make it complicated, maybe we need people who are unreasonable citizens of our society (in the world but not of the world), but with reasonable footprints on the earth. Since the dawn of the industrial revolution, reason has become a value to be strived for and valued. Science began to be treated with a type of reverance and we are told that emotions are bad and need to be mastered by the rational brain. Now as someone who believes in the importance of science (after all, I am doing a science degree) and the undenyable advances it has made in our lives, I cannot say that this reasoned attitude does not have its benefits. Science is a great and important endeavour, and one that should receive far more funding than it does. I don't believe knowledge for knowledge's sake is ever a waste; I think you can never know too much. Especially when you consider the power and arrogance of the human race in contrast to what it really knows about the world. However, this is the root of one of the problems with the dawn of the reasonable man. While I think it is impossible to know too much, it is far too easy to know to little. Man's advances in science have been vast and important, but science has become a panacea in the the minds of the public, instead of the tool it is meant to be. A good scientist will be able to tell you how little we truly know about the world. It is my impression, and perhaps I am wrong, that it is not so much the scientists boasting that science is the solution to everything, but rather the engineers, the politicians and the laymen. A scientist understands the importance of uncertainty, and the significance of the fact that science is based on disproving hypothesis, not proving theories. A theory is simply a hypothesis that has not been proved wrong yet. This does not, of course, mean that science cannot conclude findings with reasonable confidence, or undermine the values of these findings. It does seem to create some loss in translation however. Politicians etc. seem to either believe science is infallible, so that what it says is always correct, or if it suits them, they bring up the uncertainty of science as an excuse not to believe in findings they don't want to be true or that are uncomfortable. They are aware that to the untrained public, only 100% certainty is reassuring, despite the fact that this does not exist in science. Therefore, they have manipulated science into both an all knowing idol for the public and a biteless bark when they choose not to use it. Engineers like to borrow the credibility from science to suggest projects like putting mirrors up in the sky to reflect the sun away from the earth to help with global warming. Or dumping iron into the ocean for the plankton to eat (it might have worked if the sun had been able to reach through the first few cm of soil). Environmental engineering is a very Cornucopian style of doing everything (science has always saved us before, so it always will). Yet it makes me want to scream. What arrogance, what terrible, insane arrogance that humans think we can simply start tampering with important environmental problems we don't understand! In America, when the Californian Condor was rapidly declining into extinction, they decided to try and save it by leaving carcasses out for it to find and eat; even though they weren't sure exactly why it was declining. It turned out to be lead poisoning. And oh, opps, those carcasses they left out? Shot with lead bullets. Yeah, we are brilliant. So let's throw caution to the wind and environmentally engineer the whole world. What can go wrong? (Note: I don't mean to imply environmental engineers cannot make some valuable contributions to sustainability). Science is held up on a pedestal because it respresents the ultimate version of the reasonable man. It is completely objective and free from human values or influences (trying to smother laughing with coughs and not succeeding). I think is is about time we all, including scientists, accept the fact that as humans, we are never truly objective, and everything has a bias in it, whether we intend it to or not. To conduct an experiment we have to choose a topic (which will be something we find interesting), we have to design hypotheses (which will be the explanations we think likely because we cannot test everything) and we have to design the experiment (which will have inherant biases because logistics limits the way we can collect data and on what). There are value judgements inherant in all of these steps. In other words, there is no such thing as a reasonable man, if this is an objective and scientific person. In economics, the reasonable man is known as the rational man or Homo economicus (note the attempt to borrow the credibility of science by using a latin name in the traditional taxonomic form). This being is characterised by the fact that he will always act to obtain the highest possible benefit for himself given available information about opportunities and constraints in achieving his goals. He is rational because he attempts to reach his goals with maximum utility and minimum cost. The theory does not necessarily state that the man's goals are rational from society's perspective. It is my fear that the value placed on reason and rationality is leading to a growth in social darwinism in the west. After all, it is reasonable to say that if a man is poor, he should get a job and work hard, save money and then he will stop being poor. This reasoning gives us an excuse to throw compassion out the window. If the poor are poor because they are too lazy to get a job, why should we care? Never mind that we are ignoring the many reasons why getting a job might be harder for that person than for us. If a person on the street asks us for money, it is not reasonable for us to give it to them if they are going to spend it on alcohol or drugs. Indeed it is not reasonable to give them money at all. We earnt it, so we have the right to spend it. Yet think about the hypocracy in our judgement of the poor. We are saying they have no right to drink or take drugs, yet many of us to these things ourselves. Why should the poor be held to a higher standards than we are? And surely compassion tells us that if we were stuck on the streets, homeless and cold with no food, we would want to drown our sorrows too? But compassion isn't reasonable. Social darwinism tells us that the poor are not worth as much as us, after all, they don't earn as much as we do. Yet we know this is not the way God sees the world. I think the ideas or reasonable and rational men leave something to be desired. It is not reasonable to sacrifice yourself for another, or to reduce your own utility that others might be able to increase theirs. It is not reasonable to take the hard or the long road through suffering because it is the right thing to do or because suffering adds to character. It is not reasonable to put aside your own goals, or even sacrifice them to help others meet theirs. Basically, sacrificial love is not reasonable. It is not reasonable to turn the other cheek. It is not reasonable to forgive. It is not reasonable to be humble and meek. Frankly, it is not reasonable to have faith. After all, faith is the belief in things not seen, the proof of things hoped for. To believe in God because you have faith without proof is not reasonable. Yet we do all these things. Therefore, I suppose Christians are unreasonable people. So next time reason tells you that you shouldn't give the $50 in your pocket to the guy on the street, or that you shouldn't stay home to spend time with your kids when you could be at the office, or that you shouldn't care about the environment when we are all going to die anyway... How about you throw reason out the window and ask what Jesus would do? Let's be proud to be unreasonable people. Maybe it will help us save the world. Give a Solar Panel to an East Timorese family for Christmas! How cool is this for a sustainable Christmas present that gives twice? 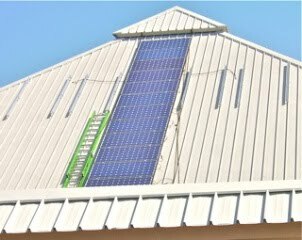 The Alternative Technology Association (ATA) is offering Christmas gift cards representing support for the installation of a solar panel for an East Timorese family- $50 or a whole solar system for an East Timorese family -$150. While the practice of animal sacrifice seems, to us, a cruel and brutal thing to do; it is important to remember the context in which God made these commands. The fall has set creation apart from God, and only blood can cover our sins. Until the sacrifice of the Messiah, animal sacrifices are necessary. We might find that hard to accept, but perhaps we forget that we have a great and amazing God - a God worthy of sacrifice. But God did not design this as bloodthirsty slaughter; it is an intricate, ceremonial ritual. Respect for the animals being sacrificed is demanded. God says that anyone who slaughters an ox, lamb or goat and does not bring it to be presented to the Lord as a sacrifice"he shall be held guilty of bloodshed; he has shed blood, and he shall be cut off from the people". As I said, the animal must be respected as a sacrifice to God, or there are harsh penalties. Also, I am not sure I am interpreting this right, but I wonder if this passage means that all animals killed for meat, must also be made a sacrifice to the Lord? This would mean that all killing is in need of sanctification, and would fit in with the fact humans were to be vegetarian before the fall. The second half of this chapter is also interesting. God proclaims that the blood of a creature is its life, and therefore the Israelites are never to eat blood or "I will set my face against that person". All blood is to be poured out on the ground and covered with dust. In so doing, the Israelites were to respect the life within the blood. I was flipping past Twenty to One last night, when it mentioned a line from the movie Wall Street - where it said that greed is good. One has to wonder, when it was that greed went from being a sin to being a virtue? After all, I think the Bible is pretty clear on this matter - Psalm 10:3 says that "the greedy man curses and spurns God". Luke 12:15 says "be on guard against every form of greed; life is not in posessions". Think about that verse for a moment. I think this is a message our society desperately needs to hear. Obviously, greed is not good in God's eyes. So when did it become good in our eyes? When did it become something silently, if not vocally, supported by most of our society? Perhaps, although it might be more obvious today, this is not really a new phenomenon. After all, before we just wanted to be rich, we wanted to be rich with a title. For most people, poverty is something we fear and strive to avoid. I don't think anyone really sets out to be greedy. We start out just wanting to feel 'secure'. It's insidious. Our society tells us that it is intelligent to save, to have a nest egg for 'a rainy day', and secular society pursues wealth as a means of feeling secure and being able to buy the things we 'need'. Then, as we accumulate more wealth, we begin to rationalise about why we need all of the money we have. It begins to take more and more money to make us feel secure. Yet God challenges us to rely, not on money, but on Him. I was challenged recently by reading a book discussing the conflict between the occurance of rich christians and the starving in the same world. This book boldly declared that wealthy Christians should be willing to sacrifice their own standard of living in order to help the poor. Indeed, it says to not do so is sin. This is a challenging accusation. In most circles at the moment, this is a barrier people are unwilling to cross. We are being sold lines about saving the planet, even reducing our consumption, but few people are willing to actually point out that we need to 'live more simply just so others can simply live'. Those that do point this out tend to be accused of advocating a return to hunting and gathering or some other nonsense. It is possible to reduce our impact on the planet without going back to the dark ages. Of course, the powers that be don't want us to think that, because they need us being greedy. They need us to buy hundreds of products we don't need every year to keep the industries alive, and to keep the economy growing (see my last rant). We don't have to turn progress back, we do have to make radical changes. How radical, I don't know. But why not start by making our lives closer to the Christian ideal? After all, it's an unregrettable option. The worst thing that can happen is we become better Christians. With a bit of luck, we help save the world. Keep posted on my Christian Living Series for some of my ideas on how to do this. For a start, let's fight the sin of greed- because whatever movies or our culture want to tell us, greed is NOT good. My laptop has been slowly dying for the last month, so eventually I finally got around to taking it to be repaired. We eventually worked out that I needed a replacement part. The problem is, HP no longer stocks this part. Also, even if they did, it would probably make more sense for me, economically, to just buy a new laptop. As an environmentalist though, I have qualms about adding to the tonnes of E-waste thrown away each year. I am left with little choice though, because things are simply not made to last anymore. There is a good reason for that. After World War II, the American economy was booming; but they faced a dilemma. They had all these factories employing people and making things, but they no longer needed the products. If they simply went back to business as usual before the war, the economy would plummit. So they did some thinking and realised something. If you sell someone an appliance for $1,000 and it lasts for twenty years, then your total income from that customer is $1,000 per 20 years. But if you sell them the same product at the same price and it only lasts for two years, then you can sell 10 of that product to the same customer in the 20 years and make $10,000. This example is, of course, overly simplified. Once consumers realised the reduced value of the product they would want to pay less, and externalities such as the environmental costs of being so wasteful , the costs to consumers of having to waste more time shopping, and the emotional costs of having your appliances break when you need them. However, it is perfectly standard for these factors to be ignored by economic models, so it seemed like a brilliant idea. Consumerism was born. Next, they began making products so cheap that it made no financial sense to repair the old, and people began simply buying new things everytime something broke - and throwing out the old. This ability to buy everything you need and the absence of a need to repair anything then contributed to the loss of skills among the population. People stopped learning how to sew and cook, or fix the car. They could simply pay someone else to do it. Or, in the case of sewing, they would probably just buy new clothes. By this point, everyone was really enjoying this incredible miracle called economic growth. But it was still limited by the fact that people only need so many things. So they found a way past that barrier. So now we have this consumeristic society, set up in order to create limitless growth for economy. If we stop spending enough, the entire thing grinds to a halt and there is panic. But when are we going to face the impacts of what we are doing on the planet? When are we going to realise that limitless growth is impossible on a planet with finite resources? Growth for growth's sake is the philosophy of a virus. And, like a virus, we are slowly killing our host. If we are going to survive, consumerism may have to go. But do we have the strength to fight something designed to give us our every desire? Can our faith give us the strength to make the necessary sacrifices because it's the right thing to do? I suppose the future will tell. Reading a reflection on Exodus 13:21 discussing the way God sends us 'pillars' to remind us of His presence and help when we need it, reminded me of the way God always sends me animals when I need a boost. When I am feeling sad, lonely, or just unsettled, God likes to send me His creatures to comfort me. Usually they are insects. I have had praying mantis (particularly appropriate don't you think? ), butterflies, lacewings, beetles, caterpillars... all sorts of creatures simply land on me or appear at these times. Sometimes it is a bird or a lizard. I let the insects crawl over my hands for a while, admiring their beauty, uniqueness and trust. They lift my heart, remind me that God is with me, that He is the great and powerful creator, and that He loves us all. It usually only takes a couple of minute with these creatures to lift my heart and give me a new sense of determination to run the race. What 'pillar' does God send you when you need a lift? Where would we be without our fellow creatures? 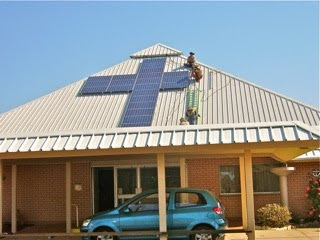 Awesome Solar Panel Cross Installed at Caloundra Uniting Church! 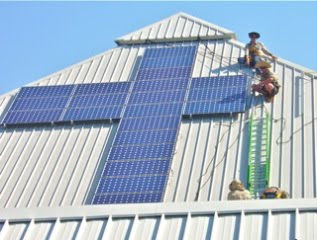 Check out these awesome photos of the installation of the solar panel cross at Caloundra Uniting church. Great work by their Social Justice group! This is possibly the first installation of its kind in Australia. I will include more information about this exciting story in the next Salt and Light Newsletter. If you aren't already on the list, email me at fiveleafecoawards at gmail.com to be included. I used to volunteer for a wildlife rescue center after church on Sundays. It was an incredibly rewarding experience, and the wildlife carers were very inspiring and praiseworthy people. Something I learned very quickly is that wild animals are never really grateful for your help. My friend would rescue and 'pinks' (baby mammals who don't have their fur yet) from mothers hit by cars that were so young they seemed certain to die, yet when eventually released they would run (or often hop) away without a backward glance. She would rescue swans only to have them bash her over the head with their wings, have goannas try to scratch her, birds peck her and wombats try to destroy her house. Yet she never complained. She would get up every two hours, all night, to feed the babies; she would recieve calls at all hours of day and night to rescue animals, and went without complaint; and she worked so that she could invest most of her spare income in kangaroo milk formula and heat pads. She regularly visited the recycling section of the tip to collect the cages that would fill every part of her backyard in the spring; she spent countless hours raising baby mice just in case a snake came in, and she spent her 'spare time' (ha ha) sewing little pouches for the various marsupials she usually had in care, and invented new ways of feeding the little critters and keeping them alive.She suffered the pain of putting down hundreds of animals, yet believed the rare happy stories were worth the pain. She adopted a border collie from the pound who had been viciously abused. In the early days after her adoption, if a dog lead was seen or heard, Tori would cower in a corner, trembling, and often wet herself in pure terror. With a few months of love and compassion, she became one of the most friendly, happy, beautiful dogs I have ever seen. There was something so pure and innocent about that dog; she was captivating. Tori was one of the few stories of an animal expressing gratitude; yet my friend poured everything she had into all those ungrateful little animals. If they were in need, she would help them - that was just what she felt called to do. This woman's incredible and unconditional love for these creatures is, I think, a parable for how God loves us. It used to be so frustrating trying to catch injured animals. They would run around, injuring themselves more, and often hurting us, because they couldn't understand that we weren't going to hurt them. And why should they trust us? After all, in 95% of cases, it was a human who had caused their injury, sometimes intentionally. Yet all we wanted to do was catch them and heal them. I wonder how often God feel this way. How often is He trying to help us, trying to lead us towards His good plans for us when we are digging our claws into the carpet and hanging on as though our lives depend on it? How often does he love us and give us everything, only to have us give nothing back - or worse, abuse and hate him? How often are we dragged to heaven kicking and screaming? Regardless of why, what she did was wonderful. And the plans God has for us are wonderful, even if we don't know it yet, and even when we are ungrateful. The example of my wildlife carer friend reminds me of how God must feel, and how much he loves us. Surely we can trust in that? The REDD (Reducing Emissions from Deforestation & Degradation) negotiations for the Copenhagen summit raise big questions about how money will be raised to preserve the forests, exactly what it is for and how it should be distributed. Greenpeace and other NGOs advocate a simple approach: For each forest country establish a baseline, where forests are right now; Monitor what happens to them using satellite imagery and on-the-ground research; Reward financially those developing countries which accurately monitor and report on their mitigation actions. Other approaches such as assigning carbon credits for carbon stored in the trees and allowing the credits to be traded against emissions reductions elsewhere would be more complicated and risk allowing virgin forests to be replaced with monoculture plantations. Description: Come together in meditation, prayer and reflection for our Earth on the first day of the Copenhagen climate talks. People from all faiths, backgrounds and walks of life are welcome and valued. Organisation: The Earth Vigil is an initiative of a non-affiliated group of individuals. Date/time: Monday 7th December, 6pm - 7:30pm.Location: Martin Place, SydneyCost: Free. Register your group online, or just come along. For more information, see the Earth Vigil website. A single prophetic stance unified leaders from six different religions when they met with Penny Wong on October 27th. With the negotiations in Copenhagen around the corner, they advocated that Australia adopt corageous, ambitious targets for the sake of the world's poor and for future generations. Reducing your meat consumption is one of the most effective things you can do to cut back your greenhouse gas emissions. Observing a weekly meat-free day is one way of doing just this. Some people and groups may already be regularly abstaining from meat, including as a part of their religious or spiritual practice. Others of us could make a difference by doing so. ARRCC's Meat-Free Day resources include:- Background information on how moderating meat consumption is good for the planet, good for the poor, good for animals, and good for your health- Practical ideas to help you reduce your meat consumption, and to encourage your faith community to do likewise- Faith resources - materials, teachings and website links- Quotes from religious leaders in support of reducing meat consumption- Frequently asked questions Meat-Free Day launchThe Meat-Free Day initiative was officially launched on 2nd October, Gandhi’s birthday, with a gesture common in Eastern traditions - the breaking of coconuts. The launch took place as a part of the UN International Nonviolence Day celebrations in Parramatta Mall, Sydney. Read about it and find a link to the photo gallery here. Churches are invited to walk together as part of the Micah Challenge global campaign of Christians speaking out against poverty and injustice as part of its call for action on climate change. State Library, Swanston St Melbourne. The march will then go around to Princess Bridge to make a human sign. Look for the orange and white Micah Challenge banner. Around the world, on this day churches will be encouraged to take action as part of the global day of action on climate change in the lead up to the climate change talks in Copenhagen. Micah Challenge which is a global campaign of Christians speaking out against poverty and injustice has put together some resources for churches to take part in on this day. There are a range of activities you can choose from such as reading out the Micah Challenge prayer, participate in the world council of churches bell ringing, planting a tree, asking people to write letters or encouraging a group from your church to attend walk against warming the following weekend (see below). From 7-18 December this year, countries will meet to hopefully agree on a global deal climate change as part of the United Nations Framework Convention on Climate Change (UNFCCC) negotiations in Copenhagen. What targets should be set by which countries? How much money are countries willing to put up to address climate change â€“ both in terms of reducing greenhouse gas emissions (mitigation) and also in terms of giving money to poor countries to help them cope with the effects (adaptation). - Climate change is one of the most serious threats to sustainable human development and poverty reduction. The Stern Report (2006) stated that: "The poorest developing countries will be hit earliest and hardest by climate change, even though they have contributed little to causing the problem. Their low incomes make it difficult to finance adaptation. The international community has an obligation to support them in adapting to climate change. Without such support there is a serious risk that development progress will be undermined." â€¢ Take a leading role in international efforts to reach an agreement to keep the global temperature increase below two degrees. This should include a recognition that while all countries must play a part in mitigation efforts, developed countries have a responsibility to shoulder a significantly larger portion of the burden due to our much greater per capita contribution to climate change (both historically and currently) and our greater capacity to finance mitigation. Australia must be prepared to reduce its greenhouse emissions by up to 40% below what they were in 1990 by 2020 and by 80-90% by 2050.
â€¢ Commit to its fair share of external funding required by developing countries to adapt to climate change. At present the amount required is uncertain but it could be as high as $100-150 billion pa, of which Australiaâ€™s fair share would be $2-3 billion pa. This funding should be over and above the international aid commitment of 0.7% of Gross National Income (GNI). Politicians receive lots of emails and letters. But when a local voter takes the time to personally call or visit face-to-face, they are much more likely to listen. The feature documentary The Fair Trade tells the story of Tamara Johnston who, devastated by the tragic death of her fiance, makes a bargain with God in exchange for a meaningful life. She and her twin sister Shelby join forces with brother-in-law Steven to start one of the first fair trade skincare companiesâ€”Anti-Body. Even as Tamara becomes a successful activist for human rights and social justice causes, despair over her loss remains unabated. As she nears the deadline of her bargain, a trip to Africa allows her to visit the fair trade co-op from which Anti-Body buys its organic shea butter. There, she finds a surprising answer to what is required of her in exchange for a sustainable life. Keeping Promises: Do Pledges Work? A popular component of many behaviour change efforts involves asking a person to make a commitment, or “pledge”, to undertake the desired behaviour. This typically involves getting them to sign their name to a promise to save water/energy/emissions. The common perception is that this will make them more accountable, and thus more likely to follow through on the requested behaviours. This months article asks the question as to whether the commitment approach actually works, and if so, how and why? There is a certain amount of evidence across a variety of settings to suggest that gaining a commitment does indeed have an effect on behaviour. For example, strong support has been found for the effectiveness of “promise cards” to encourage people to wear seatbelts, discussed in a 1991 review by Geller and Lehman. In a series of studies, drivers were asked to sign a written statement of commitment to use seatbelts for a period of time (1-2 months). Subsequently, the researchers found that “In every case, a significant number of promise-card signers increased their use of safety belts”. More importantly, the effects of this intervention were found to be more effective in influencing lasting change than similar approaches which used incentives to entice people to wear seat belts. In the environmental field, the results are similarly compelling. A couple of studies have shown the effect of commitment on recycling behaviour. Pardini and Katzev conducted a simple study where groups of households were either a) given an information leaflet about recycling, b) asked to make a verbal pledge to recycle, or c) asked to make a written pledge. Both groups which made the pledge showed higher recycling behaviours, with the written pledge resulting in the strongest, most enduring behaviour change. As with all behaviour change efforts, it is important to consider if the intervention is likely to make a difference long-term, rather than just for the duration of the intervention. A 1990 study in a retirement home found that residents asked to sign a 4-week group commitment increased their recycling by 47%. When the researchers checked in after another 4 weeks, this increase had been maintained. The same study also looked at recycling behaviour of a group of students and found that both individual and group pledges worked to change behaviour, but only those students who signed individual pledges maintained the change over a follow-up period. This study echoed the seatbelt finding mentioned above, that signing a commitment is a more powerful facilitator of long-term change than providing incentives. So it appears that gaining a commitment from people is a worthwhile, and fairly cost-effective, step in increasing the likelihood that behaviour change efforts will be effective. It is worth considering why commitments work. The theory of “Personal Norm Activation” suggests that, once we have committed to a course of action, we have cemented it as a personal norm, or something that we see as a moral standard in ourselves. Any action which is at odds with that commitment therefore triggers a personal norm, providing a motivation to act. Similarly, the theory of Cognitive Dissonance, which has been discussed at length in previous issues of Wake-Up Call, goes some way to explaining the effectiveness of commitments. When we perceive a misalignment between our actions and our beliefs or values, then we experience discomfort and/or confusion. Thus, we work hard to maintain “cognitive consistency”. Making a commitment serves to create a belief that we are on board with the behaviour being proposed, so we do our best to ensure that our actions match this belief we have about ourselves. This process does, however, rely on us being self-aware - of our commitments, our behaviour, and any misalignment between them. If we are not conscious of our behaviour in relation to our beliefs, then dissonance is unlikely to occur, thus removing the motivating factor. This is one reason why highly habitual behaviour (which tends to occur at an unconscious, “auto-pilot” level) is more resistant to the effects of commitments. This phenomenon is discussed at length by Matthies and colleagues, who states that “when car use habits are strong, the whole process of norm activation and evaluation is blocked, and situational cues will lead directly to the habitualised choice of travel mode, without moral or other motives being considered”. As a result, it is suggested that some form of habit disruption is combined with the commitment, as demonstrated by the Matthies team. (Habits are also discussed in a previous Wake-Up Call). Finally, as always, this approach is best used in combination with other tactics, including a thorough consideration (and removal where possible) of real and perceived barriers to the desired behaviour. ConsACT invites you, your family and friends to join the Walk against Warming which will coincide with the International Day of Climate Change and be the midpoint of the Copenhagen Climate talks. It is billed as a great family day out with local live music bands, comedian Rod Quantock plus environmentally friendly and sustainable market stalls. NPAACT General Meeting Thursday 19 November 2009 - The Murrumbidgee Corridor-the good, the bad, and the ugly. When and Where: 8.00pm Uniting Church Hall, 56 Scrivener St, O'Connor (corner of Brigalow and Scrivener Sts) Who: Everyone is welcome, bring a friend, ample parking in the church grounds.Brian Summers,Project Officer, Lower Cotter Catchment,and Darren Roso, Ranger In Charge, North Rural Region, Parks, Conservation and Lands. THe Murrumbidgee River Corridor has a long history of human pressure and this is evident in many degraded sites. The MRC revegetation project aims to revegetate the degraded areas to restore some of the original values and contribute to reversing the effects of climate change. Come and hear about an area close to Canberra's suburbs and join us for refreshments afterwards. You are warmly invited to meet a fantastic crew of runners travelling 6000km around Australia to raise awareness about Climate Change. What: the welcome will be accompanied by a briefing on the national security implications of climate change, led by Senator Penny Wong (ALP), Senator Christine Milne (Greens), Professor Ove Hugh-Guldhberg (UQ) and Professor Paul Tregoning (ANU). The giraffe population is on the rise, despite the effects of poaching, war and habitat loss. One man turns trash into high-flying entertainment. Resettlement of people displaced by the consequences of climate change was highlighted as a major concern for churches at a gathering of ecumenical representatives from Asia and the Pacific region. According to scientific estimates, by 2050 as many as 200 million people may become permanently displaced by the effects of climate change, including rising sea levels, heavier floods, and more intense droughts. South East Asia, small Caribbean and Pacific islands and large coastal cities will be amongst the more affected. Meeting 2-6 November in Chiang Mai, Thailand, some 75 ecumenical representatives committed themselves to "support Oceania churches' initiatives and advocacy efforts on resettlement plans, adaptation and reparations to small island states", which have been "rendered victims by ecological and climate change". The Chiang Mai Declaration issued by the ecumenical gathering emphasizes the need to develop "the framework for a new Convention or Protocol on Resettlement to cater for forced ecological migrants", and concrete plans "to ensure respect for and protection of the rights of forced climate migrants". Participants at the Consultation on Poverty, Wealth and Ecology in Asia and the Pacific were welcomed by Chiang Mai governor Mr. Amornpan Nimanan. The event was organized by the World Council of Churches (WCC), the Christian Conference of Asia and the Pacific Conference of Churches. The consultation is part of the WCC AGAPE (Alternative to Economic Globalization Addressing Peoples and Earth) process. It was preceded by hearings of youth, women and indigenous peoples. Asia, whose vulnerability to extreme weather events is aggravated by poverty, showcases the links between poverty, wealth and ecology, according to a report presented at the consultation by the IBON Foundation, a think-tank based in the Philippines. The report describes a context of grave ecological and economic crisis. More than half of the Third World's poor live in Asia. Even though it is generally viewed as a dynamic and promising place to invest, Asia is struggling with extreme poverty, thus reducing the capacity of Asians to cope with climate changes. "Our region's wealth is being siphoned off in the form of corporate profits squeezed from cheap, predominantly female, labour; external debt payments to international financial institutions made at the expense of massive cuts in social expenditures; the privatization and commodification of land; and exports of people, lumber and other 'raw materials' from poor to wealthier nations", the Chiang Mai Declaration says. "We listened with heavy hearts to stories of: Burmese migrant workers fleeing political and economic oppression only to encounter other forms of oppression in Thailand; tens of thousands of farmer suicides in India; Asian students falling into debt because of spiralling tuition fees; women in the Mekong region trafficked into prostitution", participants stated in the declaration. "Poverty is the result of exploitation and monopoly, and exploitation is coupled with violence", said Jonathan Sta. Rosa, a young participant from the Philippines, describing how economic globalization impacts poor people in his country. Jonathan's brother Isaias, a United Methodist pastor and a member of a peasant's movement, was killed in 2006 in one of thousands of extrajudicial killings taking place in Philippines. "In Asia and the Pacific, neoliberal globalization has taken a stronger hold in urban centres especially with the young people. The pressure to consume, to own and to conform is enormous", said Liza Lamis, a communications consultant with the CCA. "The interlinked economic and ecological crises are manifestations of a larger ethical, moral and spiritual crisis", said participants at the Chiang Mai gathering. Therefore what is needed is "nothing less than a radical spiritual renewal […] founded on the Biblical imperatives of God's preferential option for the marginalized (justice) and the sacredness of all Creation (sustainability)". As "genuine faith and spirituality entail action", the Chiang Mai Declaration calls for "radical and collective responses, not only from Asia and Oceania, but also from the worldwide faith community". Sage advice for the hardworking greenie. An encouraging article with some good tips. In this chapter, God outlines for the Israelites which species they can and cannot eat. No explanation is given for why but modern science suggests that this was a way of God protecting the Israelites from meats that could harm them. Most of the animals designated 'unclean' were species that eat carrion, decaying flesh or are bottom dwellers who eat decaying organic matter from the sea floor. As we now know, the pig (the most famous 'unclean' animal) is prone to having a disease where cysts in the meat (trchinia worm larvae) can make people very sick. Pigs also have flesh that is very similar to human flesh, meaning that disease transferral is easier from this species than most. Although the text mentions several times that certain species are detestable or defiling, I don't think this is an indietment on the species itself, but only on their value as food. Bruce Marcot has another interesting interpretation: "I've been stumped as to why one would be "defiled" by "any manner of creeping thing" (Leviticus 11:44), especially by eating the particular non-domesticated beasts listed here. At first, I thought it was purely a practical manner, in that some animals listed such as the vulture eat carrion, which can be unhealthily full of parasites and disease; or that other animal foods, particularly those being carrion themselves, would likewise be unhealthy. Or that the term "creeping thing" referred to reptiles and amphibians and maybe small terrestrial mammals such as rodents. But then why deny the consumption of pigs and rabbits, as well as the purely carnivorous diurnal raptors and the owls, the insectivorous bat, the insects (except for locuts, beetles, and grasshoppers! ), cursorial species, and so on, which can be healthy and nutritious parts of one's diet, as they are in so many parts of the world? Snakes, guinae pigs, ants, termites, and other "creeping things" are also eaten in many parts of the world. The answer came to me when I researched the meaning of the word "defile." According to my dictionaries, defile means, in part, to "desecrate," which in turn means "to profane (the name of)," "to violate the chastity of," and, most importantly, to "abuse the sacredness of." So, to be "defiled" by consuming "any manner of creeping things" may mean to become profaned, unchaste, and unholy. But why, then, would one become profaned, unchaste, and unholy by consuming "creeping things" and other listed animals? It may be because these animals are, in some sense, to be honored and respected, that is, they themselves are sacred and chaste, and to consume them profanes oneself. That is, for people to consume something that is sacred (these wildlife) is become unchaste and unholy. To further explain this, Leviticus 11:44 refers to eating these animals as "unclean;" and "unclean" is defined, in part, as "morally impure (ceremonially impure)." This is a far different definition than simply foul or dirty or unhealthy " http://www.aracnet.com/~brucem/wildbib.htm (emphasis mine). I quite like this idea. It is worth noting that many of the species labelled 'impure' are, as mentioned earlier, flesh eaters. Predatory species such as eagles, vultures, ospreys, buzzards, kites and hawks naturally occur in very low numbers, and are thus very vulnerable to overexploitation. Perhaps God named these animals as sacred to protect them from extinction. Another group of species classed as unclean, the shark, is currently showing what can happen to these vulnerable species when they are hunted thoughtlessly. Three sharks are currently dying per second. Half are killed for their fins to make shark fin soup, an Asian delicacy. The other half are collateral damage in fishing operations targeting other species. Numbers have declined by 90% already. If sharks become extinct, the joke may be on us, as they play a vital part in many ecosystems and control the numbers of the herbivorous fish that eat phytoplankton. Oh yeah, and phytoplankton are the reason the ocean is the biggest carbon sink on earth. So without sharks we may end up with runaway global warming even faster. Not to mention sharks have intrinsic value as beloved creations of God - sacred creatures. Maybe it's a bit of both - food value and sacredness. Certainly God wanted us to think about obedience, health and compassion on his creatures. If you have another interpretation of this topic, feel free to comment! Six years ago, tiny mustard-coloured toads could be found in their thousands living under the spray from an African waterfall. No one even knew they existed until 1996. Yet today the Kihansi spray toad will be declared extinct in the wild, a symbol of the plight facing 17,000 species that are slipping towards obscurity. In the case of this charming creature, which unusually for a toad does not start life as a tadpole but as a tiny purple-hued toadlet, a dam and a fungus have combined to bring about its extermination. Almost one-third of amphibians are at risk, making them the most endangered group on the planet, according to the latest Red List of Threatened Species, published today by the International Union for Conservation of Nature. The registers assesses the status of 47,677 species. Of the 6,285 assessed amphibian types, 1,895 are in peril. "The scientific evidence of a serious extinction crisis is mounting," said Jane Smart, Director of IUCN's Biodiversity Conservation Group. "January sees the launch of the International Year of Biodiversity. The latest analysis of the IUCN Red List shows the 2010 target to reduce biodiversity loss will not be met. It's time for governments to start getting serious about saving species and make sure it's high on their agendas for next year, as we're rapidly running out of time." One of Australia's most destructive fisheries is up for review RIGHT NOW. The level of destruction caused by bottom trawling our oceans and bycatch of threatened species like our Australian fur seal is grossly unsustainable. It is unbelievable that it goes on and on and on, every day. But it does. We have just 7 days to protect our endangered ocean wildlife and habitats. As an ocean lover I'm calling on you to defend our seas once again. Please take action before Wednesday 11th November. Every day, off our coastline, out of sight and out of mind, Australia's largest fishery is catching high numbers of over-fished, deep sea, long lived species which are highly vulnerable to extinction. Stretching from Cape Leeuwin in South Western Australia to Fraser Island off the Queensland coast, the 'Southern and Eastern Scalefish and Shark Fishery' is one of the most unsustainable fisheries in Australia. This is a fishery that catches over 700 fur seals each year as bycatch. It also catches our precious and threatened sea lions, albatrosses and dolphins. This is a fishery that bottom trawls our deep sea, destroying fragile habitats as it goes. This is a fishery that has recently increased its quotas for vulnerable species of concern. Now is the time for us to make a stand. Please TAKE ACTION NOW. Submissions on this destructive fishery are due 5pm (AEST) 11 November 2009. Incredibly, this fishery has recently increased the quota for the threatened and hugely over-fished orange roughy - our 'old man of the sea', that deep sea, iconic fish that lives for over a century, not breeding until around 30 years of age. This fishery also catches deep sea sharks, gulper sharks and gemfish - all red list species in Australia's Sustainable Seafood Guide. All threatened, all under immense pressure from our very own fisheries. The Government is assessing this fishery and may give export accreditation to fish caught from overfished stocks with environmentally damaging practices.It is incredible that the Australian Government could put their hand on their heart and claim that this fishery is sustainable. Our ocean wildlife needs you to speak out and sign on to the letter today. Be assured that our cyber actions do work. They give AMCS the muscle to let our government know that the public is serious about ocean protection. Please sign the petition today and send to your friends. Together we will let the Australian Government know that we want our seas managed sustainably, and we want it now. Click here for more information on the the review of this fishery from the Australian Government website. Most EU countries derive their biofuels from palm oil plantations in South-East Asia, where the conversion of rainforest to palm oil is fuelling climate change and is a major obstacle to any agreement at Copenhagen on protecting world forests. As long as Western consumers cannot, or will not, see that their addiction to moving fast and far is in effect destroying the planet, greenhouse gas emissions can only go on rising. Sooner or later we need to face the question: Is land primarily for growing food or for growing fuel? To borrow the motto of one of Australia's largest woolgrowers, Clyde Agriculture, which is having its properties environmentally certified, ''Esse quam videri'' - ''to be rather than to seem to be'' - is the only way forward. AUSTRALIA should not bank on being able to reduce its greenhouse emissions by storing carbon dioxide from coal-fired power plants, US climate advocate Al Gore has said. A day after The Age revealed plans by the Brumby Government to gamble on "clean coal" technology in Victoria, Mr Gore expressed serious doubt about its viability and said Australia's focus should instead be on renewable energy. NEW YORK - Al Gore has released a follow-up to 2006 best-seller An Inconvenient Truth, the former US vice president's rallying cry against global warming, a statement said on Wednesday. It is hard to know what to say about Leviticus 1. As an environmentalist and believer in Animal Rights, it is hard to stomach. Yet we must note that our God, unlike most of the other God's in the area and the God's of peoples like the Aztecs and Incas, is not satisfied with human sacrifice, but rather with that of animals. That the Lord asks for the sacrifice of perfect animals (perhaps because before original sin this is how they would all have been) clearly indicates that God deems animals worthy to do Him honour - as we have earlier seen that the altar of natural stone is the desire of the Lord. Also, we note that God does not condone the random or vicious killing of animals - the sacrifices are steeped in tradition and God dictates very specific proceedures on how it is to be done. The ceremony is based on respect for God and for His creatures. We cannot pass this section of Genesis without a mention of Mount Sinai - the great holy mountain of God. Although "the whole earth is mine" (Exodus 19:5) according to the Lord, Mount Sinai was where God came down upon the mountain in the sight of all the people. The Israelites were only allowed to stand at the foot of the mountain, with the higher reaches being so holy only Moses was invited to enter there. When Moses came down from the mountain his face shone because he had been speaking with God. The story of Moses and Mount Sinai is the story of the original 'wilderness experience'. Today, many people turn to nature and the wilderness when they wish to be closer to God. In the wilds we find it easier to still the noises of the world and instead hear the quiet voice of God. Nature's majesty and splendour leads us to praise God and its bounty and joy to thankfulness. Town planners try to cater for our need for nature by providing parks as small oases where we can escape from our cities. For others, their gardens are a vital link to nature - their connection to soil and life. Some have to retreat to the wilderness, to climb the mountain in order to find God. It is an important part of our lives of faith to take this time to worship and connect with God through creation. People worship in different ways, but for those of us who need nature, it is important to protect areas of wilderness and natural beauty so that future generations will also have somewhere to go and learn about God. Everyone needs to make their face shine occasionally. The student association at the Australian National University (ANU) in Canberra will be the first in the country to become carbon neutral. GOOD winter and spring rains will allow a large volume of River Murray water to be set aside for the Lower Lakes. PRIZE-WINNING short films on sustainability made by young Victorians - including primary school-aged students - will be screened at Federation Square in December to coincide with the Copenhagen climate change conference. SCIENTISTS expect the Federal Government will list koalas as vulnerable to extinction. In this reading, God instructs Moses that if he wishes to make an altar to the Lord, it must be made of natural stone, which has not been touched by a chisel. It is interesting that God makes this distinction. He implies that He wishes to be worshiped, not with what is man-made but with that which He has created himself. Obviously God doesn't think that humans are needed to improve things to make them worthy of Him. Perhaps instead of all our magnificent churches and cathedrals we should have adopted the approach of the outdoor cathedrals - just a cross, some seats and the surroundings of nature or a forest. God doesn't ask for stones cut neatly into squares to build the perfect altar, he asks for natural stones- blemishes and all. Nature can be untidy at times, but God loves it the way it is. In the same way, people in Australia need to learn to love our untidy looking Eucalypt forests instead of longing for the green rolling hills and manicured parks of England. If God wanted those things here they would have been created here. Instead, God loves our rugged sunburnt country and we need to learn to fit our culture and values into this landscape and not make the same mistakes our ancestors made when they treated this country as though it were England - and suffered the consequences in drought, salinity and introduced pests. I was re-watching the first Transformers movie the other day when something occured to me. It was the scene where Bumblebee sacrifices himself to save the two kids then the police all decend to 'neutralise' the threat. I couldn't help thinking that we always do that. We humans seem to be unable to live with anything we see as a threat. Throughout history we have wiped out, or hunted almost to extinction, many species that we have seen as either a threat to ourselves or our livelihood. Just look at the declines in wolves, tigers, bears and sharks. Even the Tasmanian Tiger(Thylacine) was wiped out because we thought it would eat our livestock. We have killed dingoes and crocodiles for the same reason. Even people who generally like animals often think it is ok to kill them if they have, or might, kill us. Look at the shouts from the media to kill the shark after every 'attack'. I applaud the poor victims and their families who sometimes have to remind us all that it is not the shark's fault, and we were in their habitat. As the science shows, it's not like sharks get a taste for human flesh, and they move on so fast I have to wonder if it is ever the same individual who is killed when we do hunt down the 'maneater'. I wonder if maybe humans have been on the top of the food chain for so long that we don't know how to live with threats anymore. It's like our knee-jerk reaction to kill spiders when we see them. On the scale of one to ten, spiders are probably only a two in terms of danger. They are tiny, and quite easy for us to avoid. And yet we don't seem to think that we should have to avoid them, so we just kill them. Where is our belief in the sanctity of life? It all kind of goes out the window when we feel threatened doesn't it? I suppose that's why we do senseless things like put nets near beaches to kill things in the hope that will mean we don't get bitten by sharks (shark nets do not close off beaches as popularly believed, and in fact provide no protection at all. But they do kill hundreds of sharks, whales, turtles and fish each year). Our fear has also reduced the success of various wolf reintroduction projects around the world. Farmers get scared and shoot the wolves to defend their stock. We can't live with losing a little livelihood for the survival an endangered species? We don't seem to manage the things we fear, or our own fear, we simply annihilate the threat. So if we could overcome our fear of other creatures, would the world become a better place? I think it would. This is an area where education can play a big role. Have you ever seen someone hold a snake for the first time? When one of the animal shows came around to your school or at the zoo perhaps? It can be a magic moment, a moment that turns fear into respect, and eventually respect into liking, or even love. Today's society desperately needs more contact with nature, and especially more contact with God's creatures. It is easy to fear the unknown, but if we have contact with these creatures maybe we can learn to care for them instead. After all, the Bible says that perfect love drives out all fear (1John 4:18). Maybe if we love and trust God, our creator, a bit more, we can learn to love his creatures; and the killing will stop. I am sure only love can save 'dangerous' species. Action idea: invite an animal show to your church and help bring people closer to animals. Or organise a church trip to the zoo. Poor countries are finally gaining a voice in the debates around Climate Change. This article is written by Desmond Tutu. Around the middle of last year I was chosen as an Australian delegate to the Asia Pacific Interfaith Youth Camp on Climate Change in Surubaya, Indonesia. In preparation for this trip, I conducted research into the Christian obligation to care for the environment so I would be able to share this point of view with those from other faiths. I came to what was, perhaps, a belated realisation- my faith compelled me to combine the work I was doing for the environment and the work I was doing for God, and indeed I was being called to do so. 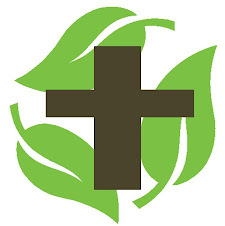 Soon after the camp, I started the Five Leaf Eco-Awards, an ecumenical church greening program designed to help churches become more environmentally friendly; and ever since I have endeavoured to do all that I can to promote the church greening movement in Australia. It’s Sunday morning so I drag myself out of bed and ride my bike to church. As I enter the solar panels on the roof glint in the sun and I can see the water tank peeking around the side. I am greeted by a smiling face and handed a newssheet printed on recycled paper. I flick to the environmental tips and events section and scan the offerings. I move to a table to place some native flowers and a box of fruit from my garden on it for distribution. I grab a cup of Fairtrade coffee and sit in the sun to enjoy the building’s passive heating. In worship we sing thanks to God for the wonders of creation and as it is September and we are doing the Season of Creation we have an interesting sermon about the need to follow Biblical practices and values in our lives in order to reduce our environmental impact. When we share communion it is with tasty, freshly baked bread from organic flour and environmentally friendly grape juice. The gentle light of beeswax candles and sunlight lights the scene. In our prayers for others our weekly endangered species prayer is for the endangered frogs we had a talk about at the youth meeting on Friday. We also thank God for the way he has blessed and added to our church through our environmental work. After the service I pack up my copy of the Green Bible and join the communal lunch. Fresh, local, vegetarian food abounds and is shared with the homeless. After the meal I quickly make a couple of arrangements for the clothes and tool swap next week. On the way out I meet up with the church greening group and we head out to Greenhills Camp and Conference Centre for a working bee. Our Canberra Christian Environmental Action group is going quite well, with our church teams and local conservation groups making quite a difference around Canberra by dedicating a few hours per week. It is a testament to the way the church has now taken leadership in the environmental arena. Ok, so I’m dreaming. Yet I have not mentioned anything that is not possible, nor anything that could not, in theory, be started today. The church could, and I think should, lead the future development of the environmental movement, and I would like churches like this to be a part of that. But we are not there yet, and an important part of greening our churches and homes is understanding the impact we have so that we know how we can improve. Let’s start with our ecological footprint. Firstly, does everyone know what an ecological footprint is? Basically, it is the area of land and resources needed to support our lifestyle. Ok, can anyone guess what the ecological footprint of a person living in the Civic area of Canberra is? size of 9 rugby league fields. As we can see, 40.5% of this impact comes from the food we eat and 30.3% from the other goods and services we buy, but clothing, construction and electricity also figure. What about the amount of water someone living in civic uses? Any guesses? We use 1,090,000 litres per person per year. Do people think this is higher or lower than the national average? It’s quite a bit higher, with the average being 722,500 litres – which is almost enough to fill an Olympic sized swimming pool. Again, this is mostly used in food and goods and services with 16.1% being used in households. What about our greenhouse gas emissions? In civic the average person creates 30.53 tonnes of GHG pollution each year. Does anyone know the national average? It’s 18.9 tonnes, or around 9 round car trips from Perth to Melbourne. If you would like to look up these figures for your suburb you can visit the Australian Conservation Foundation’s Consumption Atlas at www.acfonline.org.au/consumptionatlas or you can calculate your own ecological footprint by looking up the eco-calculator on the ACF Green Home website. So what makes these figures important? I believe you have been hearing about the global impacts of climate change over the last few weeks in services, but do you know what some of the predictions for NSW and the ACT are? • Number of Extreme Fire Danger Days to rise by 22-42% by 2020 and 137-221% by 2050. Another reason these figures matter is because climate change affects the poor the most, while we in Canberra share many privileges, including high levels of education, income and environmental awareness with this great power comes great responsibility, so we need to act. You will be happy to know that acting to reduce your environmental impact doesn’t have to be expensive. In fact it can save you a lot of money. Today I am going to take you through 10 tips from the Moreland Energy Foundation in Victoria on how to save up to $500 or 30% of your power bill in one year through energy efficiency and conservation. You will find small savings can really add up. Tip two: You can save a further 5% of your power bill by sealing doors and windows with snakes or weather strips. Tip four: You can reduce your hot water bill by 10% by installing an aerator, and save a further $50 by washing your clothes in cold water. Tip number six – get rid of the vampires sucking energy through your appliances when they are not switched off at the wall. Standby is not your friend. Tip seven – insulate your hot water pipes and system. You can literally wrap a blanket around it to save energy. Lastly, the fridge and freezer should be at four and neg 15 degrees and in a cool place to save 10% per degree you turn them up. So those are the real money savers. In terms of reducing your impact, here are some extra tips. I apologise if you already know or practice these, but it is good revision. • Try having a meat free day once or twice a week. • According to the Australian Conservation Foundation animal products make up the biggest part of the average person’s eco footprint - 34% to be exact. • Meat, particularly beef, has a very high environmental impact, using much water and land to produce it, and creating significant greenhouse pollution. • In fact if you reduce your intake by one 150g serve of red meat each week, you'll save 10,000 litres of water and 300kg of greenhouse pollution in a year. Now its all very nice to know that we should be choosing our food more carefully from an ethical and environmental point of view, but working out which products to buy in a sea of choice can be difficult. One way to cheat is to understand some of the third party labels that are available on different foods. To make sure you are equipped, I’m going to quiz you on some of the most important eco-labels on food products in Australia. So does anyone recognise this? Another tip is to mend, swap and vintage your clothes. • Buying second hand clothes or repairing old clothes could save much of this water. • Cotton in particular requires a lot of water and often also uses a lot of chemicals. In terms of paper and paper products, make sure it always recycled, and you want it post consumer recycled, not pre-consumer recycled. Made in Australia is best – try reflex. Use duplex on your printing and try to print as little as possible. You can also green your electricity supply through solar panels and/or green power. 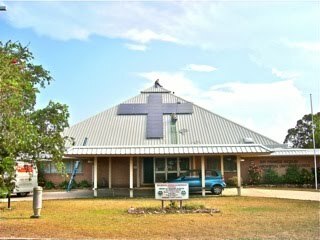 If you are interested in green power the Australian Religious Response to Climate change has a deal with Jack Green energy that will give $35 to your church if you switch to Green Power. If you would like to go a step further you can still get in on the solar bulk buy for faith groups being organised by SEE Change a grassroots environmental change group. Expressions of interest are due on the 30th of November. Final tips include sharing with your community, educating yourself, travelling earth consciously, leading by example, getting involved in environmental projects near you and thinking before you buy. If you would like some help greening your life or your church, there are many groups available to assist – including the ACF, the members of the ACT Conservation Council, the What Would Jesus Buy website and the Uniting Earthweb website which has some awesome stories about other churches and what they have done. And if you can’t find something, just email me and I will point you in the right direction. So what are you going to change in your life to make it more environmentally friendly? I will give you five minutes to think of something and then tell the people on your table. Would anyone like to tell me what they have decided? It is important to remember that we are not in this alone, and the best way to save the world is by working together. The church greening movement is an exciting and growing movement worldwide. In the UK, and particularly the US church greening is rapidly taking off and gaining a lot of power as hundreds of churches and church leaders become engaged in environmental improvement projects and environmental certification schemes. Here in Australia, the movement is smaller, but already there are some really exciting stories coming from churches around the country. Currently a new church is being built in the grounds of an environmental education centre in Melbourne for a congregation who are so focused on the environment they chose their new minister for her ability to fit in with that philosophy. Another church in Melbourne, the Port Melbourne Uniting Church is running an eco-project including a community garden which provides food for their outreach programs to the local poor. 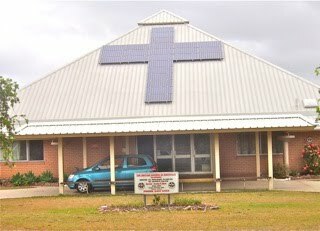 They were the first church in Australia to achieve the Five Leaf Eco-Awards Basic Certificate and they have many more exciting plans for the future. Another example is St Luke’s Uniting Church in Geelong who achieved a 22% reduction in their energy use last year, and are planning to reduce this by a further 10% this year. In Sydney Project Green Church at Maroubra Junction Uniting Church have been running their exciting program for years and closer to home we have the community garden at O’Connor UC, some exciting greening work at the Greenhills Camp and Conference centre and the solar panels recently installed my home church at Kippax. It is my hope and dream that one day all churches will embrace the care of creation as part of their worship and service of God and in response to His call. I challenge you to start by greening your own lives, and working together as a church to lead others into a more faithful relationship with God through their care of the environment.